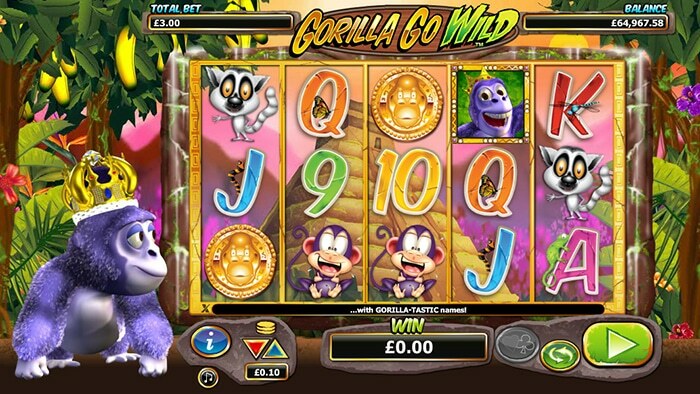 Gorilla Go Wild is a slot from Nextgen, this was previously an exclusive to specific casinos, that is now available in many other online casinos, and in our opinion is definitely worth a play. The base game features a regular 5×3 reel layout, and the minimum bet is 0.30 credits, the slot actually has 25 fixed paylines, but the extra cost is for the wealth of additional features packed into this slot. 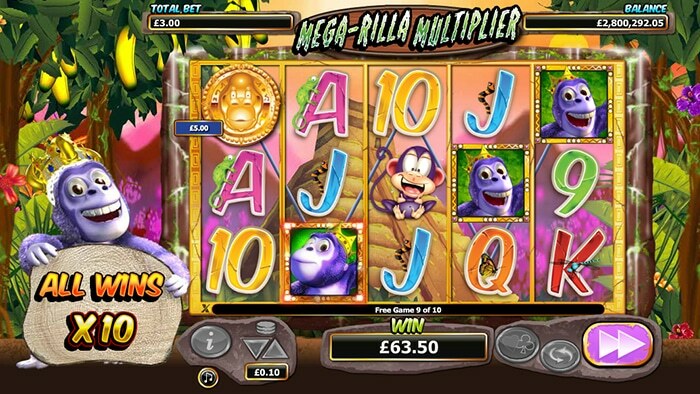 The main focus of this slot is centred around Gary the Gorilla, who can assist the player with some mini bonuses called Gary’s Bonus Time, during which he can award random cash prizes, but can also instantly trigger the main free spins bonus round too. If you are really fortunate he can also re-trigger the free spins during any bonus round as well. In the top left-hand corner of the slot is a collection of bananas, whilst playing the slot Gary may occasionally reach up and eat them, this is an important feature of the game. When you first start playing the slot the RTP (Return to Player) is quite low at 92.060%, once Gary has eaten up all of the current row of bananas he “levels up” and moves to a new location and gains a new crown. Once you have collected all the bananas the final Crown is awarded and the maximum level of RTP is achieved this is a very decent 96.512%. As a result of the increased RTP, Gary’s Bonus Time feature will be randomly awarded more regularly as you play. As such it’s normally wise to initially play this slot on a low bet, to build up the machines RTP (which once done remains in place at the specific casino you’re playing at) and secondly to unlock some of the 4 different bonus rounds available. It’s worth noting that any progression you have made is specific to the casino you are playing at and the device too, i.e the Desktop and Mobile versions at the same casinos will have totally separate unlocks, so pick a casino and a platform and stick with it! There are 4 totally different bonus rounds in this slot, that can only be played after you have made a certain progression through the game, you work your way closer to unlocking a new stage every time you trigger the bonus round itself. You need a total of 5 bonus round triggers to unlock the 2nd feature, and a grand total of 15 to unlock all 4 present in the game. The bonus features are all totally different and some are definitely more volatile in nature than the others. This is another reason why we recommend playing through the slot on your first visit at minimum stake, the first feature Gorillionaire Win Spins gives a fairly consistent return but really doesn’t have much more potential than this, if you can squeeze more than 100x of your bet out of this round then you have done very well. 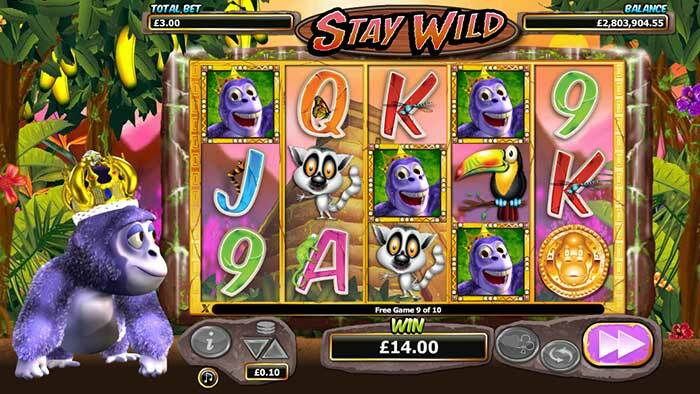 The 2nd feature however called Stay Wild does, this features Sticky Wilds and also a chance of a re-trigger (10 extra spins) making it quite possible to hit wins well over 1000x stake and this really is a little more exciting than a guaranteed win in the first bonus which could be a 3 of a kind win. The 2 remaining features are a little more volatile than the first, but in out experience still don’t have the same win potential as Stay Wild, but feel to check them out for yourself. Overall Gorilla Go Wild is a solid slot from Nextgen, filled with exciting features and matched with some big hitting win potential in the bonus round. Pick one online casino and one platform (Mobile or Desktop) and do all the unlocks on that. Play on a minimum bet to progress through the slots features and raise the slots RTP. The biggest wins capability is found in the Stay Wild feature, so play through at least 5 bonus rounds before betting higher than minimum bet. Where to play Gorilla Go Wild? Thankfully Gorilla Go Wild is now a lot easier to find in online casinos, this is a Nextgen release, and can be found at many of our recommend online casinos, places such as Guts, Redbet and Red Queen Casino are just a few which now run NYX/ Nextgen slots.